Melanie Testa and I have been hosting a Print-Along in our Facebook community. Sharing the process is part of that! 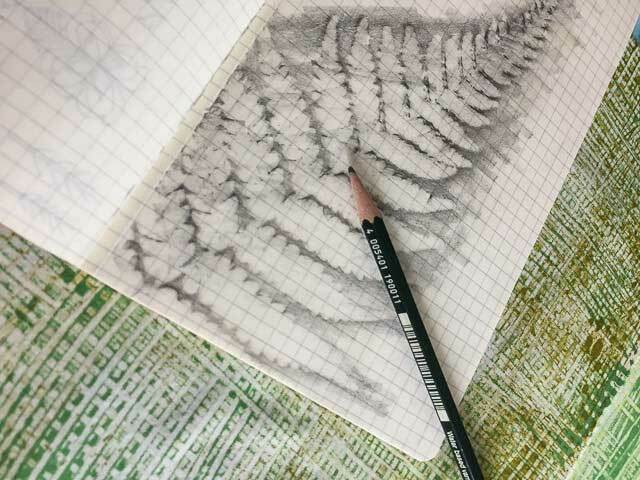 As I mentioned in my last blog post, I have been making tools for printing inspired by the ferns I so enjoyed on hikes in New Zealand. While traveling, photography is my primary way of recording what attracts me about a culture and a place, but I always carry a sketchbook as well. The photo above shows a rubbing of a fern taken off the cover of an embossed leather guest book in one of the places we stayed. 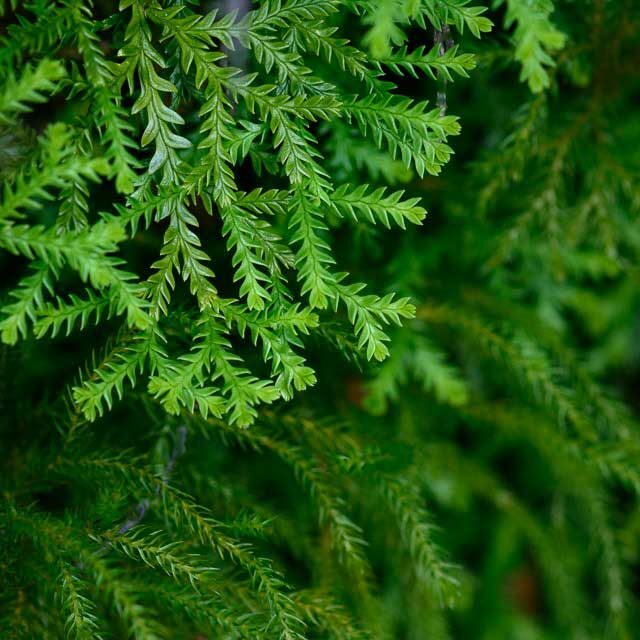 A number of the tools I am making are based on my photographs of ferns. When studying a photo, I have a number of options: I could make a sketch from the photo, do a tracing, or alter the photo in Photoshop or another image editor. I could keep it quite detailed, or abstract it. I also need to consider the scale I want the image to be when printing. 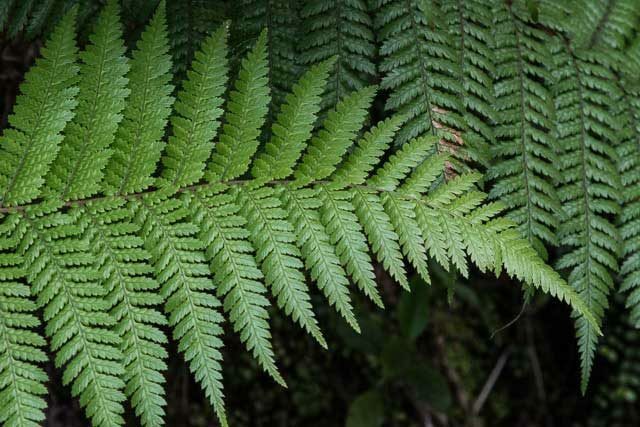 Some images lend themselves easily to interpretation – for example, the red fern image. 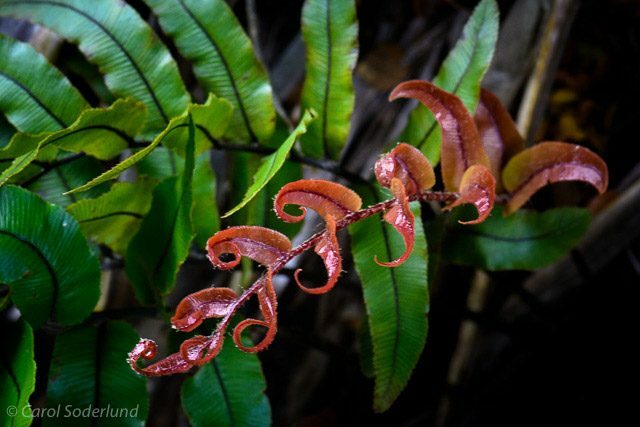 I love the shape of it, the spiraling petals, and the strong stem, in contrast to so many delicate ferns. I could isolate the main shape and increase the contrast in the image and then use it to make a Thermofax screen (below left). This technique is described on page 73 in Playful Fabric Printing. 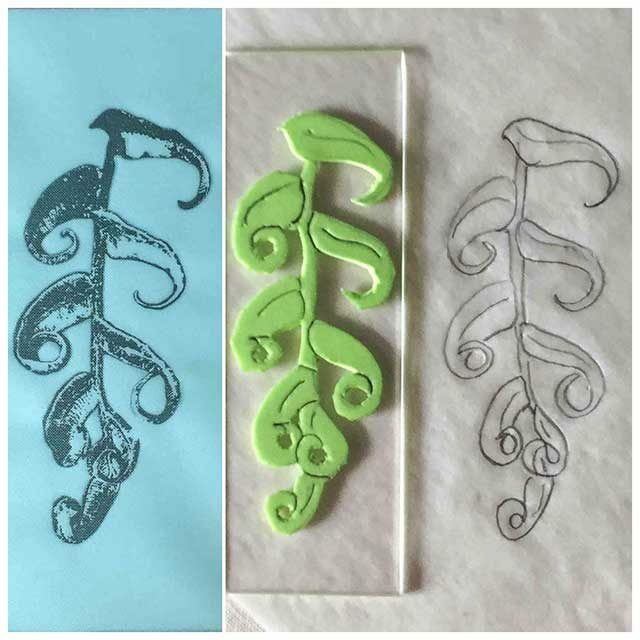 Or, I could make a foam stamp from the image by abstracting it in a drawing (below right) and then using the drawing to create the stamp (below center). This technique is described on page 58 in Playful Fabric Printing. Here are test prints from these tools. The left side is the Thermofax print. The center is the foam stamp print. The right shows layering the Thermofax on top of the foam stamp for another look. Each of these paths lead to a certain effect, or look, when printing. They are all good, so how do I choose? Often, the choice may depend on the look I want. Sometimes I will choose based on the materials I have on hand. Sometimes I will choose based on time factors; for example, foam stamps are very quick and fast. Thermofax screens can take longer, because of the graphic work required (but I enjoy that part!) Other times I just feel in the mood to carve. 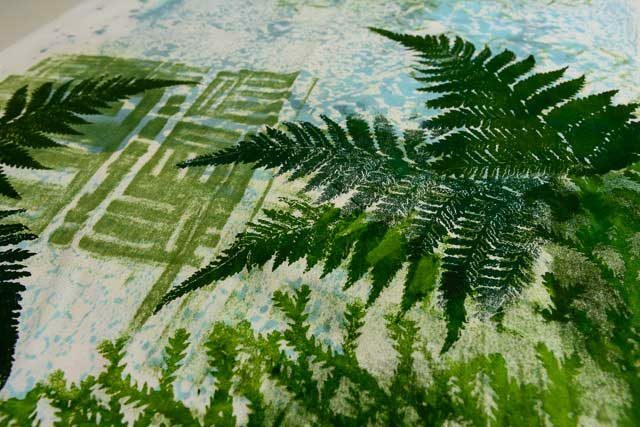 I also developed several Thermofax screens for the silver fern and an unknown lacy fern. In testing out these screens, I used as a base a cloth that had previously served as a demo cloth. Nothing is ever wasted! Here is the piece in progress. 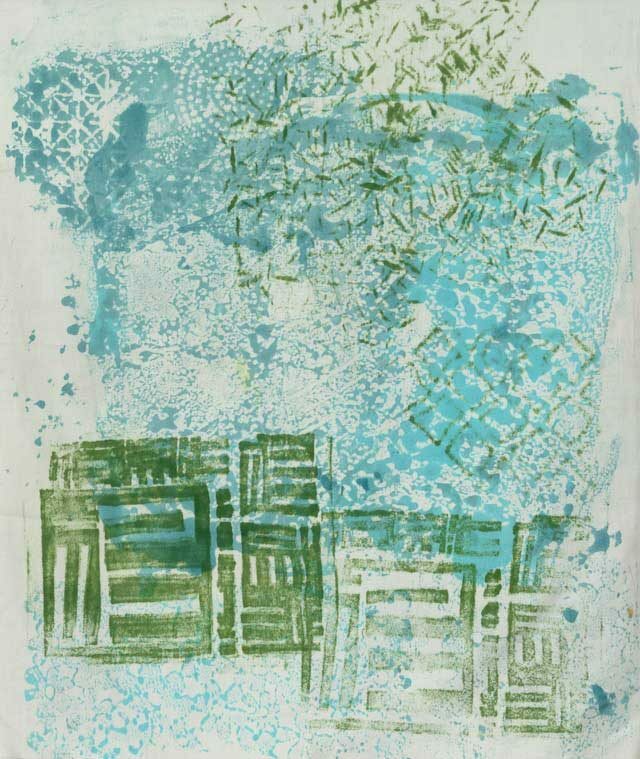 When printing in this freeform manner I often go back and forth between printing and making tools as ideas occur. It is a fun way to work! I will be away from the work for a while, visiting family for spring break, but when i get back I will show you some more tools I am working on, and the way I incorporate them into the work. Come join us printing over in the Playful Fabric Printing Facebook community! 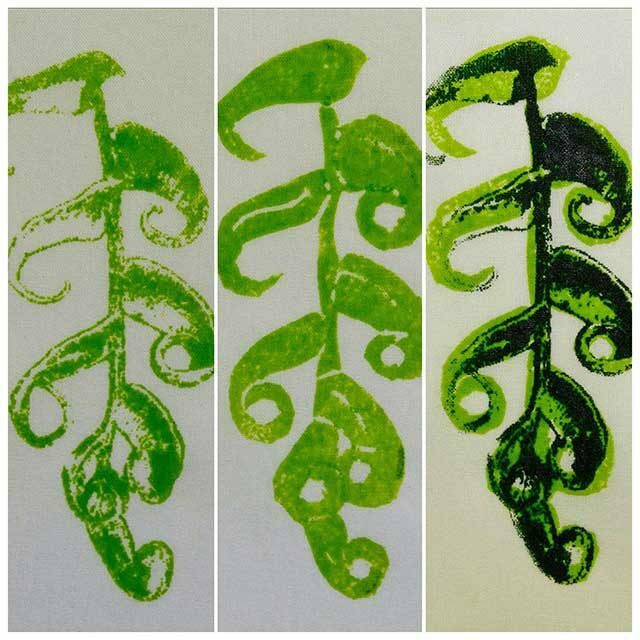 I love the fern prints! I hadn’t thought of doing a rubbing. Thanks! I ran thru Stonewall kitchen yesterday and there was a dish towel done in ferns and you were instantly with me! A sign of spring in Maine is a feast of fiddle heads ferns.